ZBrush’s new standard camera: one of the upcoming features announced at this year’s ZBrush Summit. Images in this story were captured from the livestream of the event, so apologies if they look blurry. Pixologic has unveiled some of the features coming up in future releases of ZBrush, including a standard camera with real-world lens properties, folders for grouping SubTools, and a new UV unwrap system. The new tools were announced at ZBrush Summit, the company’s annual user conference, alongside three new plugins: Intersection Masker, ZColor and Kitco Metal Quotes. 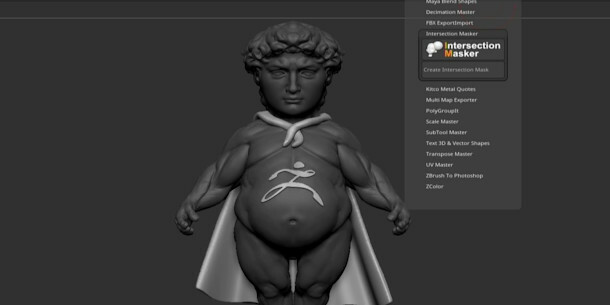 In recent years, ZBrush Summit has become Pixologic’s platform of choice to preview updates to the sculpting software: both ZBrush 4R7 and ZBrush 4R8 were unveiled at the event. Today’s demo wasn’t as specific – it isn’t clear whether the features will form part of ZBrush 2018.2, ZBrush 2019, or even end up in the same release – but it did show off some significant new functionality. That includes a much-requested feature: the option to group SubTools in a scene into folders, which can now be done from the SubTool palette, or by directly selecting geometry and using the Gizmo 3D manipulator. Once created, folders can be duplicated, making for a convenient way to duplicate complex assemblies of sub-objects, while a Boolean Folder option combines all of their individual SubTools into a single surface. 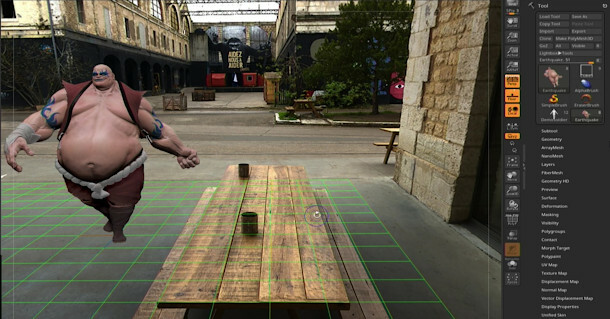 Another major feature in the new standard camera, which replicates real-world camera properties like focal length and field of view, making it easier to match sculpts to photographic backplates. The demo at ZBrush Summit showed a character being dropped into an outdoor environment, with ZBrush automatically matching the ground plane and generating a ground shadow. The camera view can also be transferred to KeyShot, ZBrush’s de facto third-party renderer. 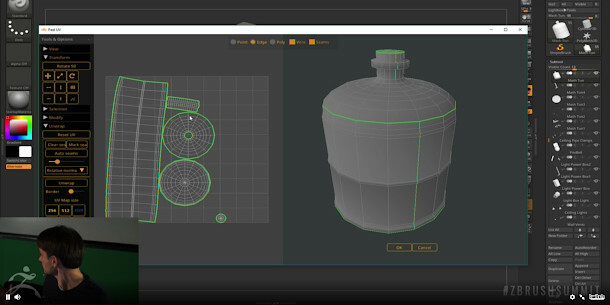 Pixologic also showed off a new UV unwrapping plugin, Peel UV. Unlike the existing UV Master, it enables users to place seams precisely, by selecting edge loops in the 3D view. Once a model is unwrapped, there are a range of controls for manipulating the resulting UV islands to improve UV packing, including the options to straighten or rotate them. Pixologic also announced three new plugins available through the firm’s online Download Center. Intersection Masker generates a mask where two objects intersect – previously a lengthy manual process – opening up new workflows for generating surface detail on a sculpt. 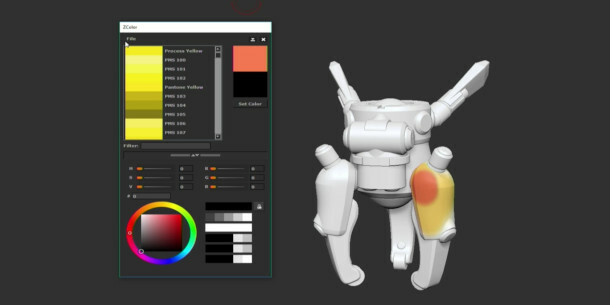 ZColor enables artists to create and manage colour palettes when PolyPainting sculpts. Users can import colour themes in .ase format from Adobe Color CC or create their own by selecting RGB, HSV or Pantone colours. Once created, themes can be exported and shared with other team members. Finally, Kitco Metal Quotes is designed for jewellery designers, and shows the estimated cost of the metal required to cast a piece, based on the volume of the SubTool selected and current market prices. Pixologic hasn’t confirmed which version of ZBrush the new folder system, standard camera and Peel UV plugin will form part of, or announced pricing or a release date for the next update. The Intersection Masker, ZColor and Kitco Metal Quotes plugins are available now for ZBrush 2018. All three plugins are free downloads.